National Blog Posting Month – Let the Madness Begin! Boredom has never been one of my life’s travelling companions. For that alone, I feel truly blessed. I think it’s partly because I’ve done so many different things in my life and had such a diverse range of interests, that I don’t find myself wondering what to do next. And, over the years I’ve developed the confidence to try new things and I love new challenges. This year, I’ve found myself writing a lot more. Not just blogging, but songwriting, teaching and soon, learning. 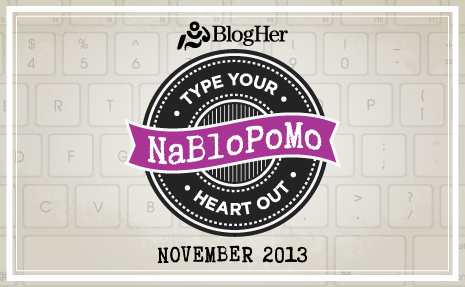 So, it seemed like a natural fit when I discovered NaBloPoMo (National Blog Posting Month) last night . As I understand it, NaBloPoMo came as a response to NaNoWriMo, where the idea is to write a novel through the month of November. I confess, I looked at this site a couple of weeks ago and thought there’s no way I could do that! But a blog everyday? Yeah, why not! Now, those of you who follow my writing will be aware that I’m without a solid internet connection at the moment. What on earth was I thinking??? I was thinking solely about the discipline and challenge of writing a piece every day. With everything that’s always going on in my life, I’ve been trying to convince myself lately to slow down a little and relax. Well, what better way to do it than through this? I find writing theraputic, cathartic and inspiring, and I know many of you do too. So in my daily schedule I am going to set aside just a little time everyday to reflect upon the things that matter (a series of pieces that I recently started and been meaning to re-visit). Can I last the distance? Can I maintain my inspiration for the entire month? I honestly don’t know, but I intend to give it, in the Australian vernacular, “a red hot go” and see where it takes me. Strap in, hang on, I think it’s going to be a fun ride! PS: It’s not too late to join in the madness – if you feel inspired sign up at BlogHer and start! Thank you Di, it’s one of the best things about this kind of endeavour – finding each other!